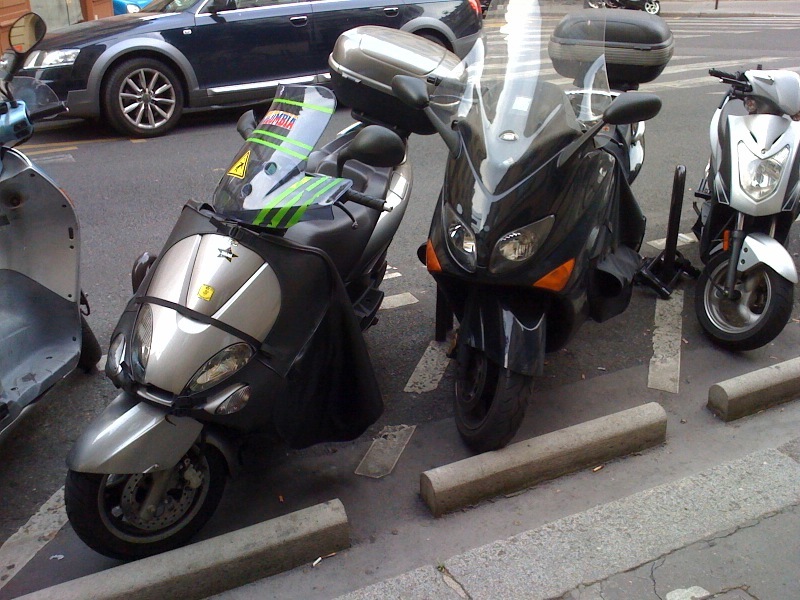 The pictures below, taken today by a No To Bike Parking Tax campaigner, show the current on-street motorcycle parking conditions in the central London borough of Westminster. One would expect the use of a mode of transport that doesn’t cause congestion to be encouraged by providing adequate parking facilities, but in Westminster, where bikes are so much hated by the council, it’s more important to save kerb space for cars and car clubs to help London remain the second most congested city in Europe. And can you imagine that riders are asked to pay £1 a day to squeeze in their bikes like sardines? £1 a day for what service? 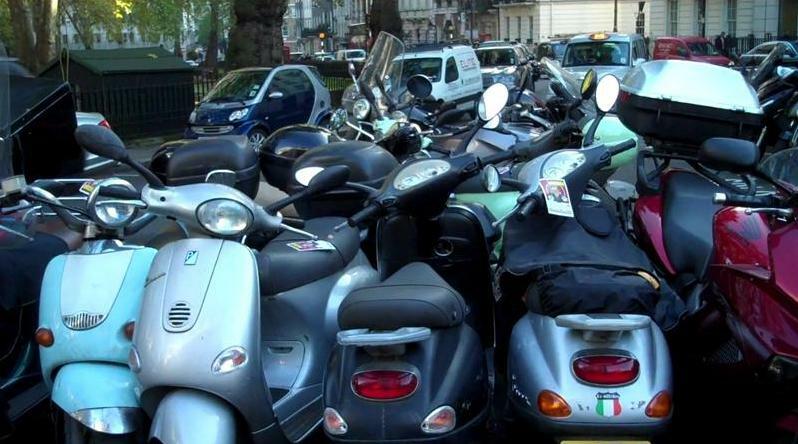 To get your motorbike or scooter damaged due to delibarate lack of parking space, while Boris Johnson’s bicycle scheme (“cycle hire”) is given plenty of space for parking! 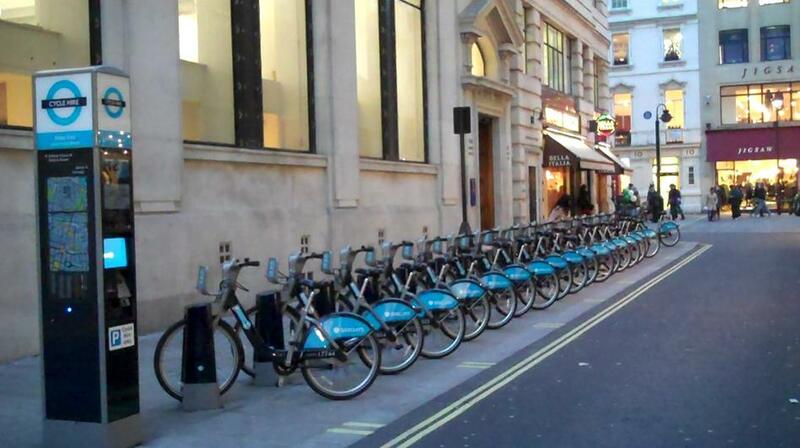 Boris Johnson's bicycle hire scheme copied from Paris. 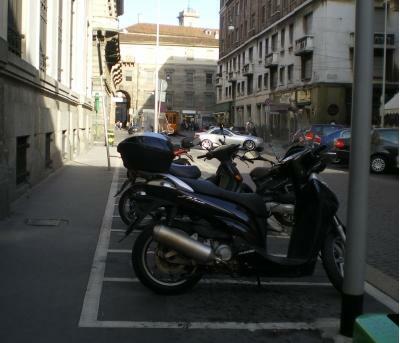 Notice the enormous space between the bicycles, which are parked on the pavement! 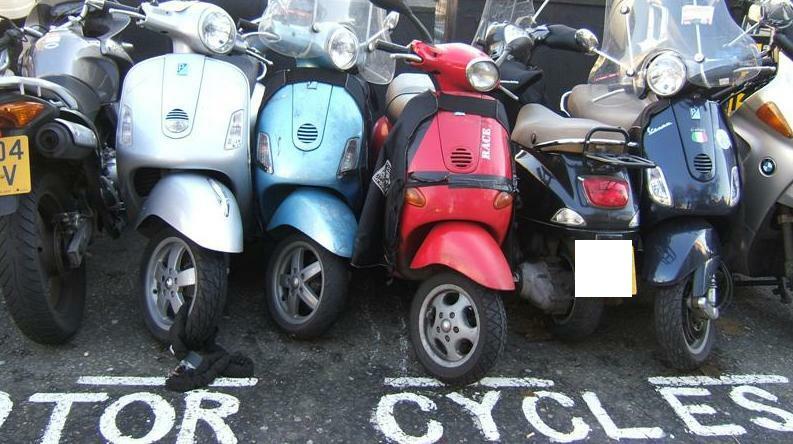 But because it’s actually the Mayor’s initiative, Westminster Council is happy to make sure that plenty of space is provided for his scheme, whilst when it comes to help London residents, who are also keen to alleviate congestion in the British capital by using motorbikes and scooters, then that’s another matter. We wonder to what extent Westminster Council is not delibarately creating these horrible parking conditions for motorcycles in a view to claiming that there isn’t enough space in the borough to accomodate them all, hence the parking tax to reduce the number of powered two wheelers (PTWs) in circulation. Pure robbery! 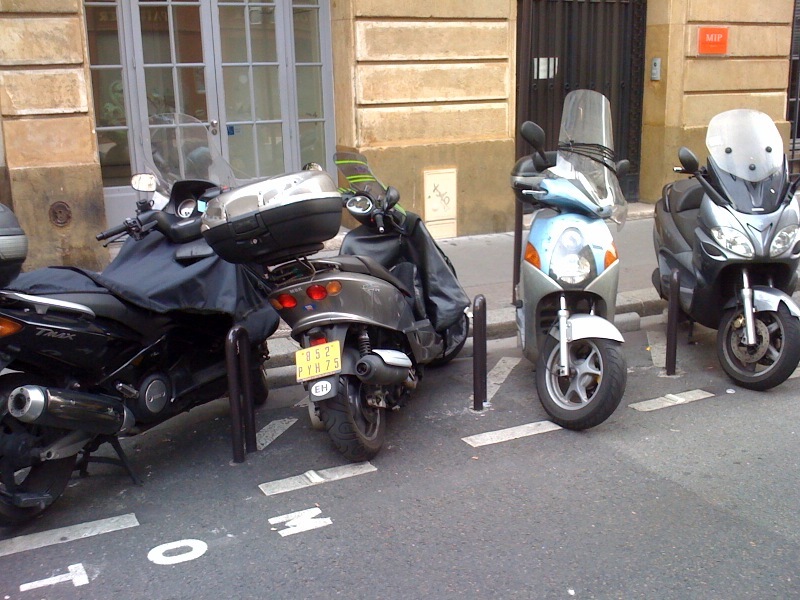 Compare the above with motorcycle parking facilities in Paris, Barcelona and Milan provided free of charge and let us know what you think! 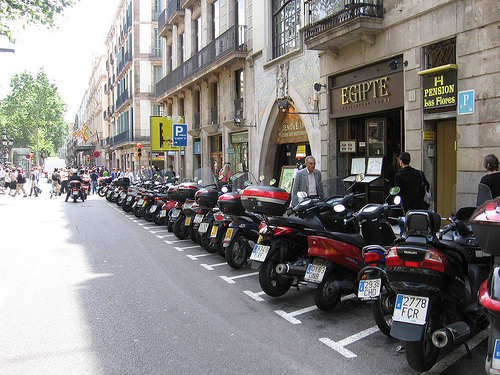 And no, don’t say that Paris, Barcelona and Milan know how to treat bikers and provide excellent parking facilities to them, because you will be preaching a converted! This is absolutely outrageous! 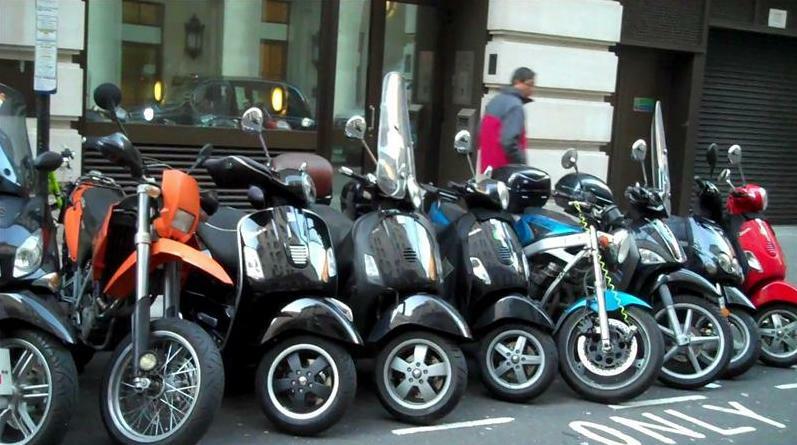 I can’t believe Westminster Council is providing so bad parking facilities for motorcycles. I didn’t know they were charging until I found this post. Unbelievable! I have looked at the campaign too, bloody awsome! Keep on fighting and you have now gained my deep support! What gets me is that I received a PCN the other day for parking my bike on a private piece of land that belongs to my employer on the grounds that my bike obstructed the footpath… but then why Boris’ bicycles are precisely allowed to park on the footpath? I am contesting my PCN as the council has no grounds for it, but it’s just a complete waste of time and hassle. This is a comment for Nick Walker. My employer owns a piece of land around the building and WCC have no right to issue PCNs to vehicles parked on it. The use of this private land forms part of my employment contract and therefore I am legally entitled to use it, regardless of what WCC may think. We have had a few PCNs issued to our cars and bikes while parked on there and they’ve always been cancelled, but it’s just a hassle. WCC have to educate their CEOs not to issue tickets there, but I believe my Chief Exec is now planning to complain to WCC. @ Nick, in case you are not aware of it, the No to Bike Parking Tax campaign is taking Westminster Council to court and is currently taking donations for the March re-trial. There is a good prospect of success so now you can put your money where your mouth is. Nick, of course nobody cares about a quid. ‘Cos it’s ‘just a quid’, right? That’s why it is so low in Wastemonster (in fact they started with £1.50 but reduced it because of pressure from NTBPT – also known as No To Bike Parking Tax campaign). But it’s a pound a day, every day you park which, for some can cost £250-£350 a year. Then add on the cost of phone calls, some of which last up to 20 minutes – dunno what YOUR mobile bills are like – and the time and inconvenience of it all. So it’s more than ‘just a quid’ and it’s a massive cost for most of us: just becuase it’s London, doesn’t mean that everyone is bloody banker. You have seen just what Wastemonster want you to see: a tiny charge. But they make it so difficult and inconvenient to pay, their real aim is that people don’t pay, so they can slap a £60 ticket on them: that’s where the real money is. And that’s the same as a car. So, if it’s ‘only a quid’ that you don’t care about, send it to support the NTBPT case which IS in the High Court. Then look at all the other good work that has come from this campaign in exposing shady councils like Wastemonster – and their illegal ticketing and revenue generation. WCC picked this fight, but they chose the wrong enemy this time and will continue to be exposed by NTBPT until they scrap this pernicious tax. Someone has to turn the tide of these money-grabbing councils and their persecution of motorists. 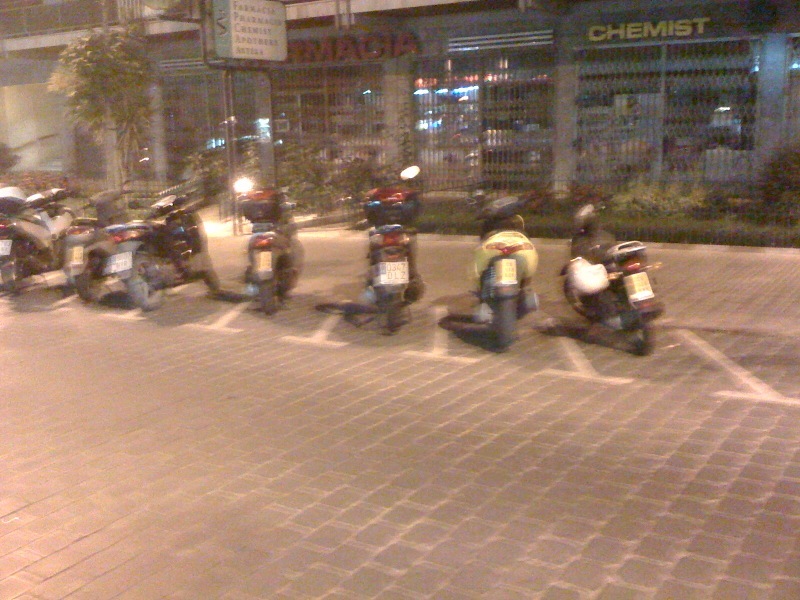 A pound-a-day charge is enough to get these bikers fired-up!